President Trump likes to build things — apartment buildings, casinos, golf courses, walls — and among his first acts as president was to approve the construction of the Keystone XL pipeline over the objections of environmental and Indigenous activists and local landowners. The pipeline would carry massive amounts of crude oil from Canadian tar sands through Montana, South Dakota, and Nebraska, threatening the environment and private property as well as adjacent Native American land, sacred sites, and water sources along the way. The pipeline has been temporarily blocked by a federal judge pending required environmental impact assessments, but if they’re completed, it is possible that construction could begin in the coming months — and many tribes and activists are at the ready to protest. That’s their right under the First Amendment, but there seems to be mounting evidence — from a new law in South Dakota to new documents from our Freedom of Information Act litigation — that the government wants to suppress protests even before they begin. You might remember a different pipeline project — the Dakota Access pipeline — and the massive protests that surrounded its construction a few years ago. Most notably, the Standing Rock Sioux and thousands of supporters from across the United States and the Americas staged a months-long sit-in to block the pipeline’s construction. At some points, private security personnel used both dogs and pepper spray against protesters, ostensibly to “protect” construction sites against incursion by those demonstrating. The ACLU and others raised serious concerns about police and private security efforts to shut down protest encampments, surveil protest activity, and prosecute and intimidate protesters. Now, we have reason to believe that the federal government is working with local officials to craft a similarly heavy-handed response to Keystone XL protests. For example, some counties are already making arrangements for where to put detained protesters if their jails fill up. And while officials in Montana are busy redirecting resources from legitimate law enforcement functions to chilling the First Amendment rights of pipeline protesters, they are largely ignoring the epidemic of sexual violence against Indigenous women at so-called “man camps” that house temporary oil workers. In an effort to learn more, we submitted public records requests to federal, state, and local governments and agencies seeking information about coordination between federal and local officials to prepare for anti-pipeline protests. The federal agencies were far from forthcoming. Only three provided substantive records at all, and they prompt more questions than they answer, so we have sued to get more information. So far, we know that dozens of federal-state planning meetings have taken place, and we discovered that an interagency task team was specifically convened to plan for Keystone XL protests. Despite that, the government has not disclosed any documents that reflect what was decided during these planning meetings, how many more took place, whether they’ve continued through today, or anything about what this interagency team has been up to. Nor has the government disclosed any information about collaboration with TransCanada or private security contractors. In one particularly absurd exchange, we wrote to the Department of Homeland Security to help it understand the type of documents we were seeking. 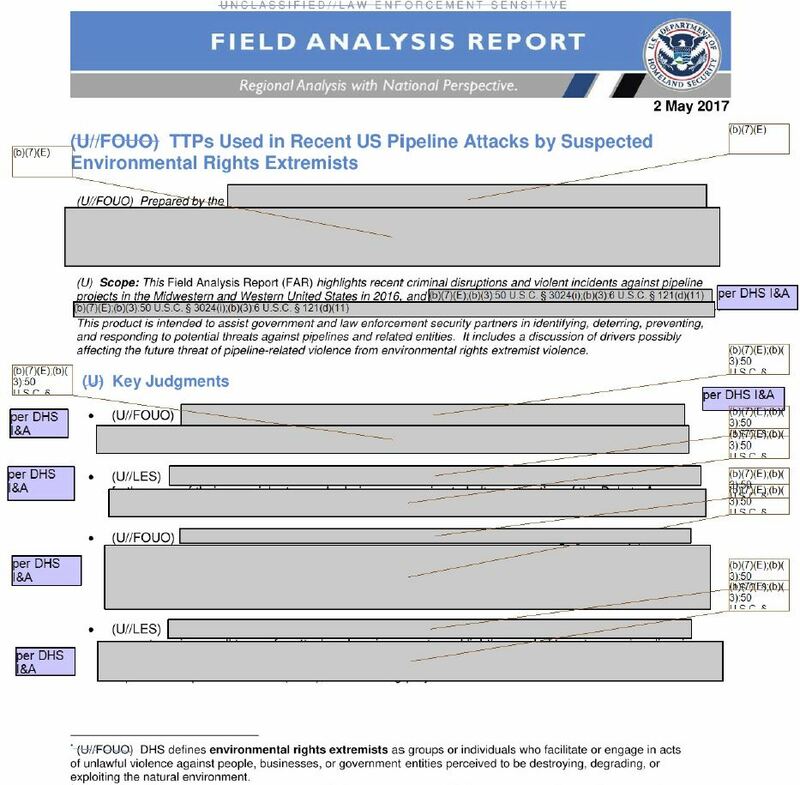 We sent them a copy of an unclassified report from 2017 that had been published in the press on “Techniques, Tactics and Procedures Used in Recent US Pipeline Attacks by Suspected Environmental Rights Extremists.” In response, DHS provided us with a redacted version of the very same report we had sent them! This “can neither confirm nor deny” language is generally reserved for national security issues that touch on the government’s most sensitive secrets. It is highly disturbing to see the government try to use a blanket non-response here. Take the best case: The FBI has nothing responsive, and it hasn’t been involved in any discussions or activities that could be aimed at suppressing or chilling First Amendment activity through surveillance or militarization. Even then, though, the FBI’s response would be claiming that the mere fact that it has not engaged in such activity is too delicate to tell the public. And, of course, the alternate possibility is even scarier: that the FBI has, in fact, been coordinating anti-protest activity with state law enforcement in Montana and other states. This could be a signal that we should be expecting the worst. The the corporations involved and the government are eventually going to put that pipeline wherever they what it so the protestors might as well bend over an except it. Stay home and let national infrastructure projects, such as this, proceed. America can no longer build great things because of your kind. If you knew anything about pipeline construction, it is the safest, most environmentally friendly means of transporting energy resources. Energy independence and projects such as this, the MVP, the ACP, Enbridge Line 3, etc. greatly increase our nation’s ability to project soft power across the globe. Stay home, go to work, contribute positively to our society. Conservatives supposedly support “free market” competition with minimal regulation - except for healthcare and clean energy! When the free market competitors offered clean-energy wind turbines, Conservatives were outraged that it might harm flying squirrels flying into the blades. Upon closer examination it was found that flying squirrels really don’t fly - they glide. So the flying squirrels altitude is limited to the height of most trees, which maxes out to around 100 feet for most states. The wind turbines are 300-400 feet tall. A flying squirrel would need one hell of a tail-wind to reach 300 feet. On healthcare, if conservatives supported free market competition, all of us could pay 1/3 to 1/2 the cost of most medicines sold in the USA. Don’t recall the police and FBI investigating clean-energy opponents and free-market healthcare opponents! How about we start building these pipelines through you & your relatives yards, then they can move on to Arlington National Cemetery, tomb of the unknown soldier.. it would be a different tune if it invaded your rights & your property! But you just go on ahead & don't work about your free speech or freedom to protest, actually.. you know what? You are exactly what's wrong with this country & this world today, so why don't you get the fudge out of the way & let's start looking for alternatives! Go back under your rock where you beat your wife, beat your kids & kick your dog! So "Jim", you are alright with FERC allowing a private for-profit company to take private property from your fellow citizens against their will? Let's "project soft power across the globe" while we beat some of our own citizens over the head with an iron bar - guess that makes America great in your opinion. Jonny, I agree with you and the ACLU. The pipe line is Gov't middle finger, to us citizens. All about $$$$$'s. we have had similar government support here in WV when protesting MVP which has been allowed to proceed inspite of 80+ property owners refusing to accept the payments that were finall ordered by the court ! Our State laws have been "revised to accomodate the pipeline development an absurd illegal change in our laws that have stood for 100 years! The only way the majority can get the majority decission is by violent or agressive passive (tree sitters ) resistance or being chained to equip! If you ever believed America was a democracy ... think again! The pipeline is the acressor not the people resisting it! The pipeline steel is supplied by EVRAZ. EVRAZ in the U.S. is a subsidiary of the Russian owned EVRAZ. Roman Abramovich is part owner of EVRAZ and was a guest at Donald J. Trump's inauguration ceremony.